Apache Axis2 not only supports SOAP 1.1 and SOAP 1.2, but it also has integrated support for the widely popular REST style of Web services . The same business logic implementation can offer both a WS-* style interface as well as a REST/POX style interface simultaneously. 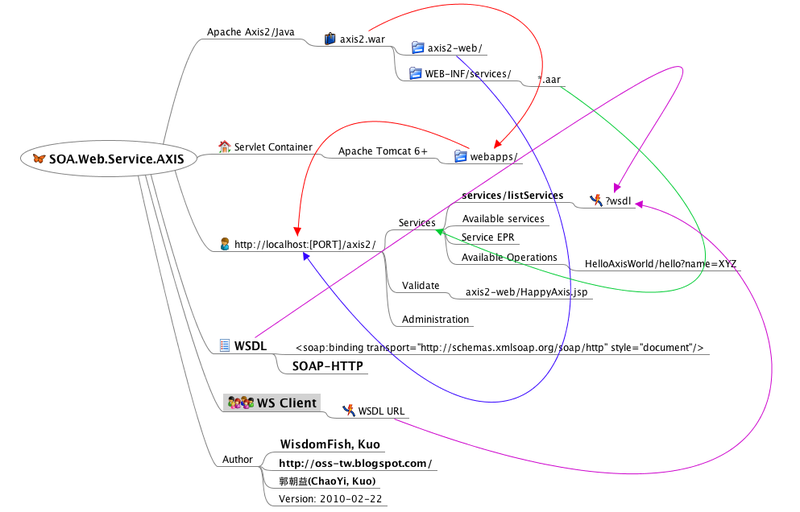 This is the Web application of Axis2, which can be deployed in most of the servlet containers. As part of the Axis2 tool set, the service archive generator is an important tool that allows the generation of service archives ("aar" file or a "jar" files) that can be deployed as a web services to the Axis2. The Axis2 code generator comes built-in with an Eclipse plug-in. This plug-in can be used to generate a WSDL file from a java class (Java2WSDL) and/or a java class file from a WSDL (WSDL2Java). First you need to install the plug-in. The instructions for the installation process are given below. Note: As a general rule, Web service tutorials are made available for each of the WTP milestones. An index to the Web service tutorials by milestone is available here.